Nexus 4, have been on Android 4.4.4 with latest DavDroid for well over a month. I would love to donate - and was prepared to do so when I found DavDroid - but, I’d like to actually get it fully working first. I’m connecting to my company SOGo account, and Calendars (all 4 of them) seem to be syncing fine. But I’m not seeing any of my Contacts. The only Contacts showing are my Google Contacts. I have 4 Address Books - My personal, and 3 that I have full Admin rights to - that all work fine with Thunderbird+Lightning+SOGo extension (Integrator+Connector), and all syncing works fine on an iPhone/iPad (confirmed they work with my SOGo account on my wife’s iPhone), but I’ve tried everything and can’t get them to show up on my Nexus 4. Same with me. I’m connecting to my email provider’s SOGo account, and Calendars syncing perfectly well. However, I’m getting errors when syncing my address book. I’ve just recently upgraded to Android 5.0 on a Nexus 4. I’m running Davdroid 0.6.7.1. Any hints on how to resolve/work around this issue are very much appreciated. @tanstaafl did you ensure clicking “contacts to display” in your contacts app? see screenshots below. Also keep in mind that Android allows only one Address book per account. This does not apply to calendars - multiple cals are allowed per account. It’s a decision by Google Android developers. 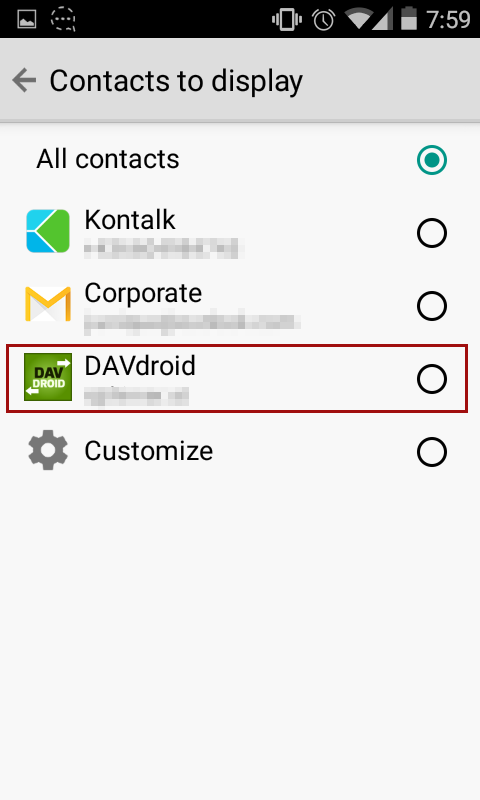 You need to create multiple accounts with DAVdroid. 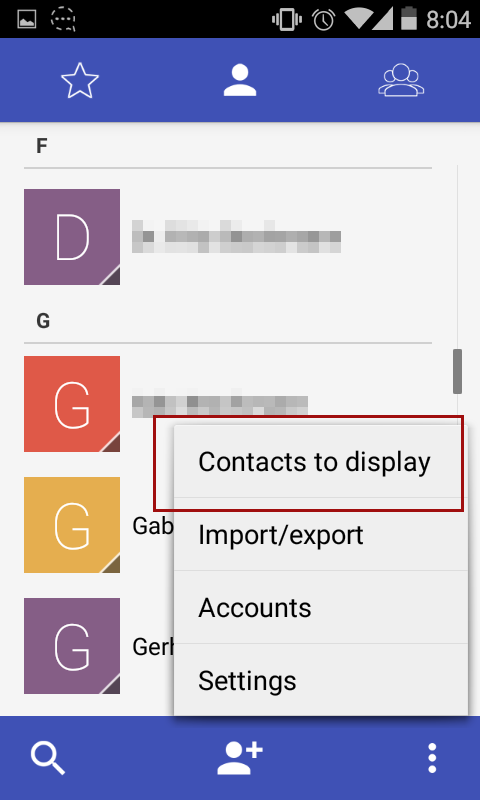 It can however only be displayed one collection of contacts using the options shown in the screenshots below. E/JavaBinder( 8959): !!! FAILED BINDER TRANSACTION !!! Also keep in mind that Android allows only one Address book per account. one collection of contacts using the options shown in the screenshots below. to add 4 different DavDroid accounts, one for each? And, I can only see one at a time and have to manually switch between them? multiple Address Books/Groups (or whatever is needed)? If I have 4 Address Books on my SOGo server that I want to sync, I have to add 4 different DavDroid accounts, one for each? Yes. That’s the way Android (not DAVdroid) handles contacts – one address book per account. Of course DAVdroid could hack around by creating multiple accounts itself, but that would be unlogical and even more confusing. You can see all at once in the Contacts app (Contacts to display > All contacts, see screenshot above). this is an Android issue?